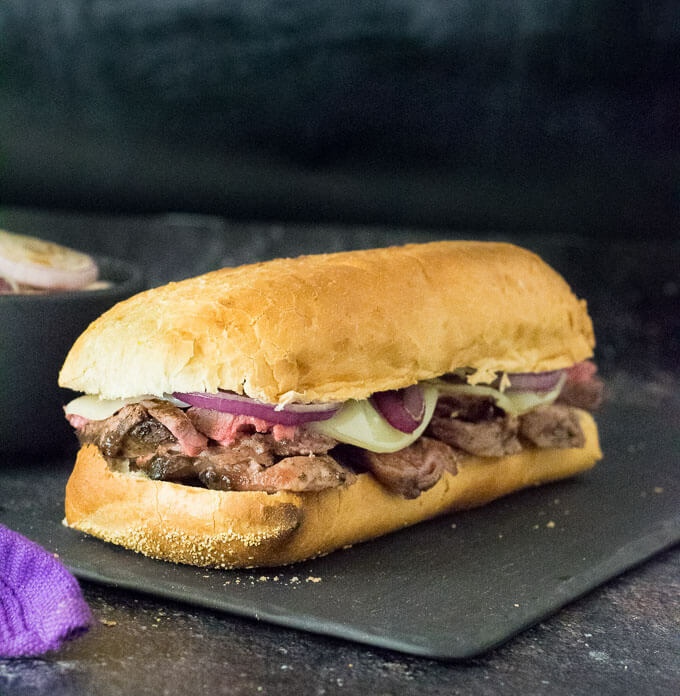 This succulent Steak Sandwich is piled high with tender sliced steak, topped with melted provolone cheese and grilled onions. Perfect for making on the grill or on the stove. Have you ever had a sandwich blow you away? And I don’t mean like hiding a hand grenade in a hamburger bun. I mean, like, taking one bite and having your eyes bug out of your head like an old-school Warner Brothers cartoon. Well, this steak sandwich will do just that. Sure, anyone can pile meat on a bun and call it a steak sandwich, but let me walk you through the finer details to really send it out of this world! The best steak sandwiches are grilled because grilling imparts more flavor into the meat. However, you can still make great steak sandwiches in the skillet on the stove as well. My recipe describes the process for cooking steaks in a skillet to make it more accessible to the average home cook. However, if you prefer to grill your steak check out my write-up on how to grill steak. A phenomenal steak sandwich starts with a great cut of steak. There are many steaks that will work well, but personally, I think strip steaks are the best. They are long, narrow and don’t contain a bone – making them ideal for slicing. They also have a bit more fat and marbling than a sirloin, for better flavor and great tenderness. Sirloins and ribeyes are also two good substitutions, however, sirloin is a tad lean and isn’t as tender, and if using a pricier ribeye you may need to trim off large chunks of fat when slicing to prevent unpleasant bites into your sandwich. 125 degrees for rare steak. 135 degrees for medium-rare steak. 145 degrees for medium steak. 150 degrees for medium-well steak. 160 degrees for well-done steak. 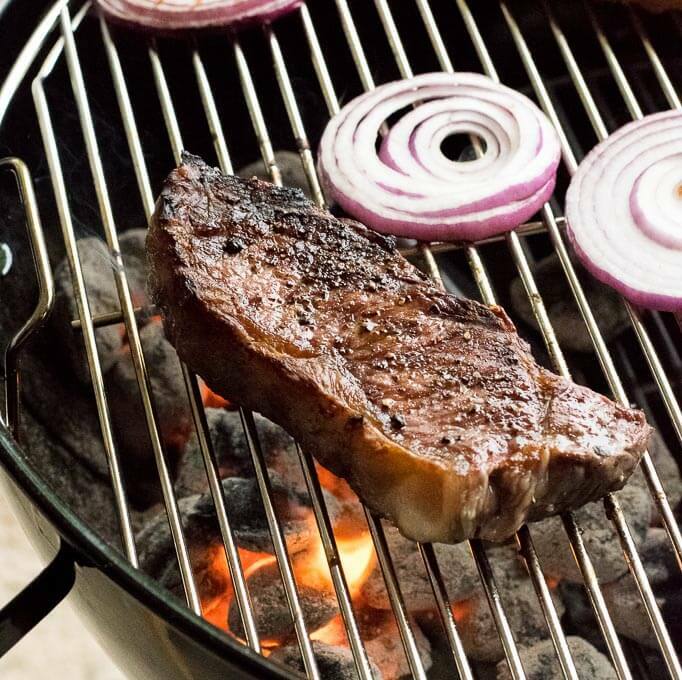 Tip: The more the steak is cooked, the less tender it will be. A high-end steak sandwich calls for an equally refined bun. A light and airy hoagie roll with a bit of chewiness to it would be perfect for a steak sandwich. A crusty baguette could also work if the interior is light. You don’t want a roll that is too dense or you won’t be able to enjoy the tenderness of the sliced steak. 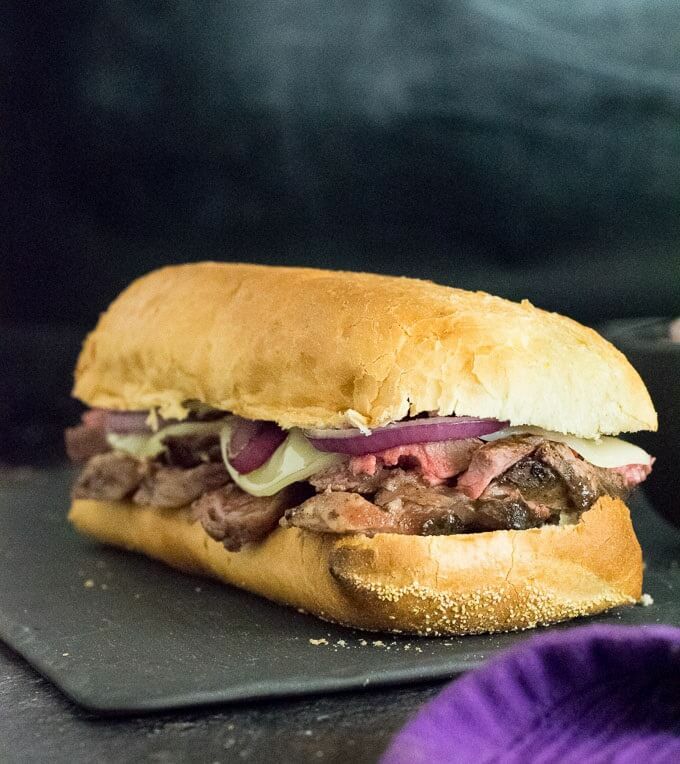 Provolone cheese, red onion, and mayo are my favorite toppings for a steak sandwich. However, you can customize this to fit your tastes. You can add peppers and mushrooms, similar to a cheesesteak, or even greens like arugula. This steak sandwich is akin to what you would find on a high-end bistro’s lunch menu. French fries or sweet potato fries would pair nicely with this dish, but when I think of bistros I think of high-end soups. Check out my Roasted Red Pepper and Tomato Soup, my Roasted Mushroom Bisque, or my personal favorite Fire Roasted Tomato Soup with Bacon. Roasted soups pair perfectly with the robust flavor of steak. Generously coat steak in salt and pepper. Add cooking oil to skillet set over medium-high heat. Place steak in the oil once shimmering. Cook the steak about 4 minutes per side, or until it reaches your desired level of doneness. Adjust temperature as needed. Remove steak from skillet once finished cooking and let rest for 5 minutes. While steak is resting add onions to the skillet and cook until tender-crisp (Keep the heat on medium-high if you want a little char on the onion). Lightly toast the inside of your Hoagie roll while onions cook. 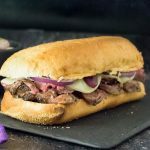 When steak is done resting, slice thinly and pile onto hoagie rolls and top with slices of Provolone cheese and onions. Slather the inside of the bun with mayo and serve. Sirloin and ribeye steaks are good substitutions if needed. IF YOU LIKED THIS RECIPE check out my Slow Cooker Philly Cheesesteaks. 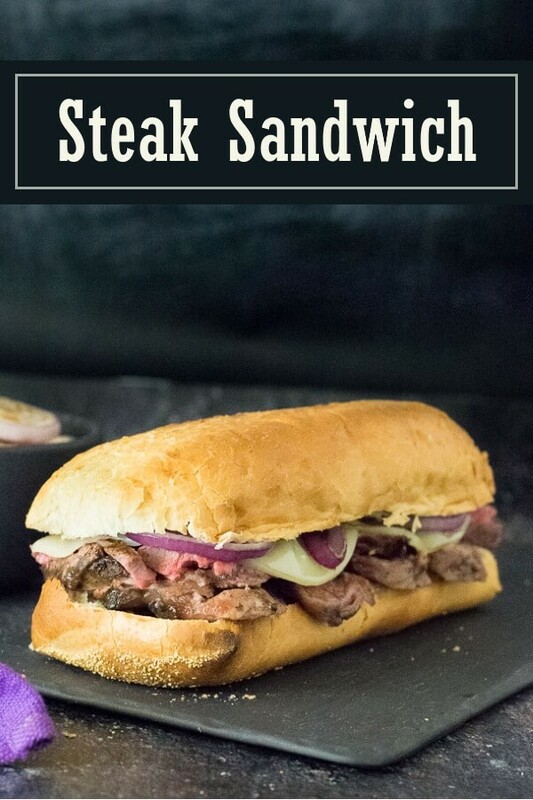 If you enjoyed reading my Steak Sandwich recipe then you should probably like me on Facebook and follow me on Pinterest too. That’s what I would do at least, because if you don’t get to know me but you still use my recipe it is kind of like taking candy from a stranger, and your mom taught you not to do that. Don’t disobey your mom, subscribe to Fox Valley Foodie today. This sandwich was AWESOME! Thanks for the recipe.